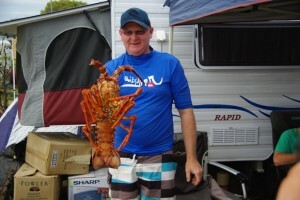 This is the count for the Christmas catch of crayfish for the 2011-2012 Robe holiday season is 28 kg. Not as good as last years 37kg but still a good haul. The Largest Cray award goes to Brendon Beacom with his 3.1kg catch. The highest Total with 11.7 kg goes to Brendon Boyd which includes 3 crays caught by hand snorkelling, one of them; a 2.5kg cray caught the last day. The best non-cray offering, caught in the Pot was Trevor Shells Cuttlefish. And the Newbie Encouragement Award goes to Bruce Hemmingway due to his impressive antics on the reef with the “Cliff Hanger” re-enactment, and constant encouragement from Jen – “Go on Bruce!”.